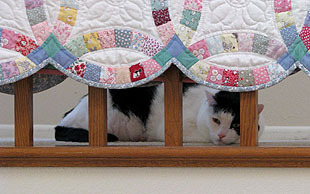 On the left, Inkblot is pretending to be in kitty jail. Pretty nicely decorated jail, though. 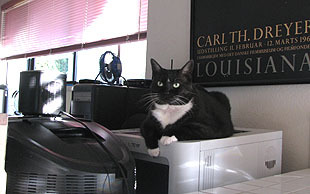 On the right, Domino is Queen of the Printer. My new food rationing plan is working well, by the way. It’s way too early to know if anyone has lost any weight, of course, but my interim Metric for Success™ is that no one starts yowling in the middle of the night because they’re hungry and want me to come downstairs and feed them. I never do, but in the past that hasn’t stopped the yowling if they’re feeling mistreated. So far, though, half a cup of dry food before bedtime is enough to last them through the night until I wake up naturally. Peace reigns throughout the house.